WEST HARTFORD, CT- The Hartford Hawks picked up their first home win of the season and rebounded from three losses on the road this weekend with a 3 to 0 win over the Holy Cross Crusaders Wednesday night. The Hawks won 25-16, 25-16, and then fended off a resurgent HC team to win set 3 25-21. Kami Nethersole started off the scoring for Hartford with one of her many spikes. Holy Cross got on the board, but Hartford started to roll with both Kami and Sareeta Nethersole picking up kills and soon it was 8-4. Holy Cross called a time out but Hartford kept rolling. Hannah Grace Stokes pulled the Crusaders within 3 with her whap off the defense but Hartford kept scoring even as Holy Cross managed to keep pace albeit a few points behind. Lindsay Makowicki smacked the ball off the D at the net, and teammate Jackie Tamburri picked up a tap kill of her own. 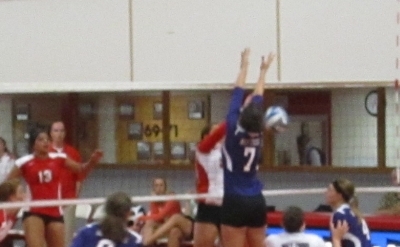 Kami Nethersole struck again soon after, and Tamburri and Michelle Cordell shared a block to make the lead 15-8. Cross’s dangerous Megan Lynch picked up a kill off the block and added a huge smash right afterward to cut the lead to Hartford lead to six, but both Nethersoles responded with kills, and Tamburri’s service ace put the score at 19-11. HC’s Callie Black picked up a pair of kills late in the set to cut the lead to 6 again but Hartford didn’t let up. Cordell picked up a kill, Dionna Kirton had a service ace, and Makowicki ended the set with a kill through the D.
On to set 2 the two teams went. The two sides battled to a 6-6 tie early including kills from Kami Nethersole, Makowicki, and Holy Cross’s Dana Weston. Sareeta Nethersole unleashed a smash, and an HC error gave the Hawks a two point lead only to have the visitors tie it back up including a block from Stokes and Black. Another Stokes block and a Hartford attack error put the Crusaders in the lead but not for long as Hartford rallied to a 16-10 lead with 8 unanswered point including two successive Makowicki kills, a Tamburri set to a gap, a titanic smash from Cordell and a block from her as well. Holly Cross jumped into the pursuit but their brief run was stopped by Makowicki placing the ball just in bounds. Cordell picked up another kill, and Lindsay Anderson joined in on the scoring party with a tip and a shared block with Sareeta Nethersole. Tamburri had another ace and the score was a daunting 21-13. Weston and Alex Aycock’s point late were not enough o overcome The last few Hartford points including a Kami Nethersole service ace, and Sareeta Nethersole’s kill to end the set. The two teams would have a much more even exchange of points in set 3 all the way to the 20-20 mark . Hartford’s scoring started off with a slick cross court shot from Cordell, Kami Nethersole blasted the ball off the defenders to the scorer’s table, Anderson put down a ball at the net, and later had a kill from the net as well, Sareeta Nethersole had a quick kill, Cordell had multiple kills midway through, and Anderson just pounded a ball through the defenders. Sareeta Nethersole and Makowicki both had a pair of kills as the back and forth continued. For Cross, Lynch lined up and launched a big kill, later Aycock shared a block. Lynch struck again to tie the score at 9 and later at 10. Aycock managed an attack that the defense could not stop as well. Lynch would later tie the score at 16 with a blast. Late, with Hartford trying to take an advantage Kami Nethersole ricocheted a ball of a purple shirt and out of play, Black responded by ending a long volley with a kill. During an especially long back and forth, both Sareeta Nethersole and Stokes had key defensive saves, though Cordell ended it. A Hartford miscue put the set tied at 20, and Aycock’s put down returned the Crusaders to the lead. That would be it for Holy Cross as Kami and Sareeta in succession picked up two more points, then came Makowicki, Sareeta Nethersole shared a block with Anderson and then finished off the Crusaders with a tap into their zone successfully. With a home win in hand, Coach Don Ferguson’s team hosts a tournament on the weekend and will face Navy on Friday. Holy Cross Coach Erin Walker takes her team up to Bryant for a tourney including Friday’s match against Harvard.